DIE Mercurii, videlicet, 15 die Junii. Commissioners of the High Commission Court petition that Suits against them may be stayed. Order for staying Horses, &c. going to York, to be printed. Merchant Strangers 5000£. for Ireland. Treaty with the Scots Commissioners. A Paper from them, to decline sending the King's Messages, &c. to the Council of Scotland. Message from the H. C.
and with a Declaration to be sent to Scotland. Committees at York to be re-called. Message to the H. C. for Committees to meet to draw up a Letter for re-calling the Committees from York; and for the Deputy Lieutenants to put the Bucks Militia in Execution. Hawes's Cause. Message from the H. C. for a Conference about Languard Fort, and the Treaty with the Scots. Message from the H. C. with an Order to the Justices of Yorkshire to keep the Arms of the Papists in their Custody. The Declaration to the Kingdom of Scotland. Letter to recall Home the Committees from York. and for the Lords to concur in an Order to the Lancashire Committees. Lady Thomas, concerning the Fens in Lincolnshire. Order for the Deputy Lieutenants of Bucks, to put the Militia in Execution in the Absence of Lord Paget. The Petition of both Houses to the King, in Behalf of the Yorkshire Petitioners. The Lord Wharton was appointed to sit Speaker this Day. The Petition of His Majesty's late Commissioners of the High Commission Court, desiring they may have no Actions brought against them for what they have done in the High Commission, according to their Commission, &c.
Ordered, That this Petition, and the Order of the 22d of April, shall be referred to the same Committee as is appointed for the Consideration of the Bill for staying of Actions, &c. and in the mean Time the Order to be suspended. Ordered, That the Order of the 11th of June, for staying of Horses and Arms, &c. in the Northern Coasts, going for Yorke, shall be printed and published forthwith. The Lord Wharton reported, "That Yesterday the Merchant Strangers subscribed Five Thousand Pounds for Ireland." The Earl of Bedford reported, "That he acquainted the Scotts Commissioners Yesterday with their Lordships Declaration; and they desired it might come from both Houses, else they cannot treat. "We are commanded, by the Council of Scotland, to signify unto your Lordships, and these Noble Gentlemen of the House of Commons, that they have received the Parliament's Paper of Thanks, and their large Declarations, that they are sorry to see the Condition of Effaires heir; and their Service and best Endeavours shall never be wanting, in what may conduce to His Majesty's Honour and Authority, and the Good and Peace of His Kingdoms, and keeping a right Understanding betwixt thame; and that, as His Majesty hes signified to thame, that He desires not that they should judge of the Actions of another Kingdom, nor take upon thame to determine the Differences betwixt His Majesty and this Parliament, so they conceive it not necessary nor incumbent to thame to send to the Parliament any Catalogue of these Messages and Letters that were sent to thame from His Majesty. 1. To desire that their Lordships would order the Committee, appointed to join with the Committee of the House of Commons, to draw a Declaration, upon the last Letters received from Yorke, to meet this Afternoon. 2. The Committee of the House of Commons have framed a Petition to the King, in Behalf of the Petitioners of Yorkeshire that offered the King a Petition, and desired their Lordships Concurrence herein. The Petition was read, and agreed to. 3. That the House of Commons have thought it fit to re-call their Committees at Yorke Home, and desires their Lordships to join therein. A Committee of both Houses to be appointed, to draw up a Letter. 4. Their Lordships and the House of Commons having nominated the Lord Pagett to be Lord Lieutenant of the County of Buck; they understanding that the Lord Pagett is gone to Yorke, and considering that Friday next is appointed for the Musters of that County, the House of Commons have made an Order, That the Deputy Lieutenants, in his Absence, may muster the Trained Bands; desiring their Lordships Concurrence herein. 5. 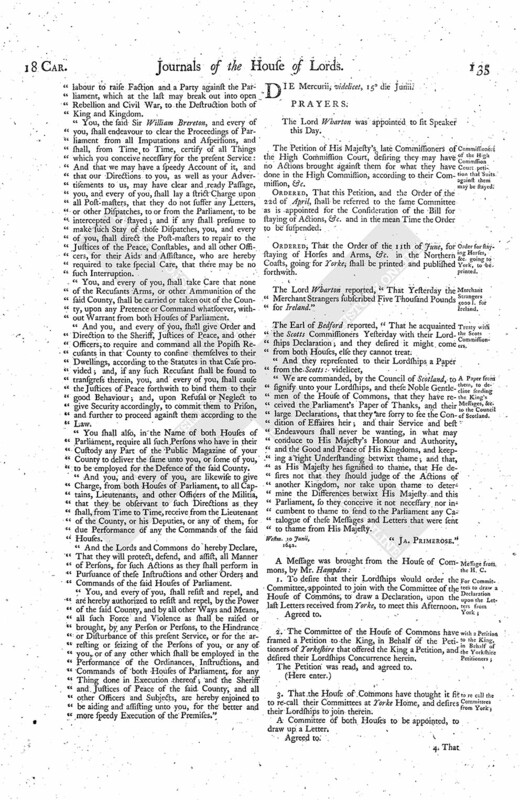 The House of Commons are informed, that, at the last Meeting in Scotland of the Great Council, many of that Nation presented a Petition to the Council, expressing good Affections to the Peace of this Kingdom: The House of Commons have drawn up a Declaration to be sent into Scotland, and desire their Lordships Concurrence. The Petition to the King was read, and approved of by this House. Next, the Order concerning the Deputy Lieutenants of Bucks was read, and approved thereof, with the Addition of these Words after the Word ["Offices"], ["according to the Ordinance of Parliament made in that Behalf"]. Next, the Declaration to be sent into Scotland was read. Agreed to, and to be printed. 1. The Committees to meet this Afternoon. 2. That their Lordships have agreed with them in the Petition to the King. 3. That their Lordships have agreed to the Declaration to the Kingdom of Scotland. 4. Touching the Two other Particulars, this House will send an Answer, by Messengers of their own. To let them know, that their Lordships have appointed a Committee of Two Lords, to draw up a Letter to be sent to the Committees at Yorke, and desire that the House of Commons would appoint a Committee of their House proportionable; and further to let them know, that their Lordships do agree to the Order made concerning the Deputy Lieutenants of the County of Bucks, with the Additions. Upon the Petition of Joseph Hawes; it is Ordered, That the Judge of the Court of Admiralty shall give Expedition, according to Justice. To let their Lordships know, that he was commanded, by the Knights, Citizens, and Burgesses of the House of Commons, and in Behalf of the Parliament and the whole Kingdom, &c.
Ordered, That the Lords shall have Notice to answer this Impeachment on Friday come Sevennight. That they have appointed a Committee, to meet with the Lords Committees, to draw the Letter to be sent to the Committees at Yorke, to call them Home; also they agree to the adding of the Words in the Order which is to be sent to the Deputy Lieutenants of Bucks. That whereas this House formerly desired (fn. 1) a Conference, concerning Langor Pointe, and the Propositions of the Scotts Commissioners; the House of Commons are ready to give a present Meeting, if it may stand with their Lordships Conveniency. That this House will give a present Meeting, as is desired. The Lord Brooke was appointed to deliver the Resolutions of the House concerning the Scotts Propositions; and the Earl of Holland to acquaint them with the Earl of Warwicke's Letter concerning Langor Pointe. "It is this Day Ordered, by the Lords and Commons in Parliament, That the Justices of Peace, and other Officers, in the County of Yorke, who have the Arms of Recusants in their Custody, which they have seized by virtue of the Ordinance for disarming of Recusants, be enjoined to keep them in their Custody, and not to deliver them upon any Warrant or Authority, but by His Majesty's Command signified by both Houses of Parliament; and that the Trained Bands be enjoined to retain their Arms in their own Custody, according to Law." "The Lords and Commons in Parliament have perused a printed Paper, under this Title, A Letter sent from the King's Majesty to the Lords of the Privy Council of the Kingdom of Scotland, bearing in the Front the Appearance of His Majesty's usual Signature, and in the Bottom this Date, Given at Our Court at Yorke, the 20th of May, 1642; as likewise another Paper, in the Form of a Petition, with this Inscription, To the Right Honourable the Lords of His Majesty's Privy Council, The humble Petition of many Noblemen, Gentlemen, Burgesses, and Ministers, occasionally meeting at Edinborough; and having been credibly informed, that they are true Copies of a Letter and a Petition sent and delivered as the several Titles import, and upon mature Consideration of the Matter therein contained, do Declare and Protest, That those Sufferings expressed in the Papers betwixt His Majesty and Parliament cannot justly be imputed to any Actions or Intentions of ours, who have endeavoured with all Fidelity to procure the Happiness of His Majesty and of this Kingdom; and that we are not guilty of laying upon the King any such Calumnies and Aspersions as are mentioned in that Paper, and seem to reflect upon us; but, on the contrary, have laboured to take the Blame from His Majesty, and to lay it upon His evil Counsel. "And as touching the Petition aforementioned, we do, with much Contentment and Thankfulness, observe the Faithfulness and good Affection of our Brethren of Scotland, in seeking to prevent all Jealousies, and to preserve the Peace betwixt the Two Nations, so timely expressed to the Lords of the Council, whereby the Hopes of those who practised to have drawn from their Lordships some Declaration to the Prejudice of this Kingdom were frustrated; and we shall never cease to answer this great Care of theirs with the like earnest and diligent Endeavours to promote the Honour, Wealth, and Prosperity of that Nation, and preserve that Union so strongly fortified by public and mutual Interest and Affection on both Sides; and we desire that the Commissioners may give Notice to the Scotts Commissioners, how heartily and joyfully we do embrace the Kindness of that Kingdom, manifested in that Petition, and order this Declaration to be forthwith printed, that so it may be published to the whole Kingdom of Scotland; hoping that this constant and inviolable Amity betwixt us will not only conduce to the Safety and Honour of both Kingdoms, but prove very useful for the Advantage and Security of the Protestant Religion in other Parts." "We are, in the Name of both Houses of Parliament, to let you know, that they command you forthwith to give your Attendance upon them; they thinking it fit not to stand with the Dignity of the Houses of Parliament, that their Committees should long reside where they have received so many Affronts: Yet they are so regardful of the Peace and Good of those Parts, that if, upon your Information, it shall appear to be advantageous to such as are well affected to the King and the Parliament, they are resolved, by sending you into some of those Parts again, or by settling some effectual Course therein, to provide for their Relief." Resolved, upon the Question, That this Letter shall be sent to the Committee at Yorke; and that it shall be signed by the Speaker. To desire the House of Commons to join therein. A Message was brought from the House of Commons, by Sir Henry Vane; who brought up the Letter, to be sent to the Committees at Yorke; they have agreed to it, with a few Alterations; as, instead of the Word ["I"] to be made ["We"], because it is to be subscribed by the Speakers of both Houses. 2. They desire their Lordships to concur with them in an Order, to be sent into Lancashire. "It is this Day Ordered, by the Lords and Commons in Parliament assembled, That Mr. Ashton, Mr. Shuttleworth, Mr. Rigby, and Mr. Moore, appointed to go into Lancashire, to see the Ordinance for the Militia put into Execution, and every of them, shall have Power to send for any Parties or Witnesses, and to examine them upon any Thing concerning the present Service intrusted to the said Committee." Ordered, That the Lord St. John's Cause shall be heard To-morrow. Upon the Petition of the Lady Thomas, concerning the Fens in Lyncolneshire; it is Ordered, That the Lord Willoughby of Parham shall certify the true State of the Cause; and then this House shall proceed therein according to Justice. 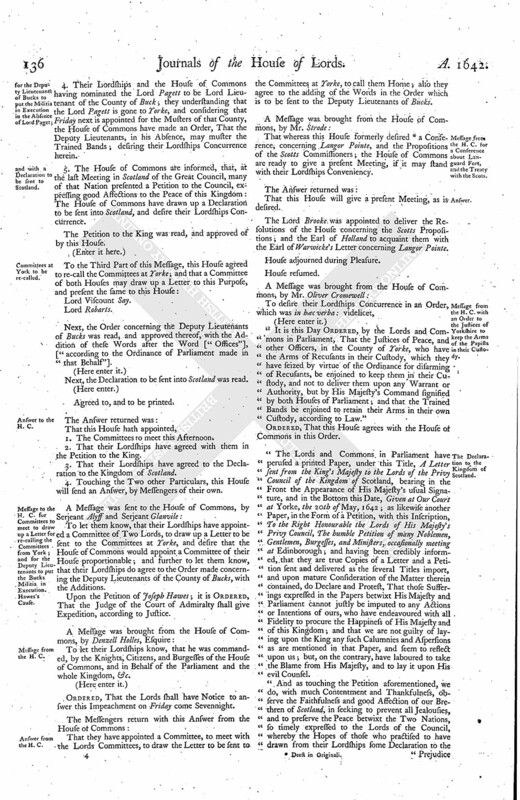 "Whereas, by the Ordinance for the ordering of the Militia of the Kingdom of England and Dominion of Wales, it is Ordered by the Lords and Commons in Parliament, That William Lord Pagett should have Power to call together all and singular His Majesty's Subjects, within the County of Bucks, as well within Liberty as without, that are meet and fit for the War, and them to train, exercise, and put in Readiness, and them, after their Abilities and Faculties, well and sufficiently, from Time to Time, to cause to be arrayed and weaponed, and to take the Muster of them in Places most fit and convenient for that Purpose; and whereas the said William Lord Pagett hath now lately absented and withdrawn himself: It is therefore Ordered, by the Lords and Commons in Parliament, That those Persons by him heretofore nominated to be his Deputy Lieutenants, and which have been approved of by the Lords and Commons in Parliament, or any One or more of the said Persons so nominated and approved to be the said Deputies, shall, in the Absence of the said Lord Pagett, have Power and Authority to do and execute, within the said County, all such Powers and Authorities as are herein before mentioned; and that the Captains and Officers heretofore made and ordained by him the said William Lord Pagett shall and may, in his Absence, do and execute their said Offices, according to the Ordinance of Parliament made in that Behalf; and that any Two or more of the said Persons, nominated and approved to be the said Deputy Lieutenants, shall, in the Absence of the said Wm. 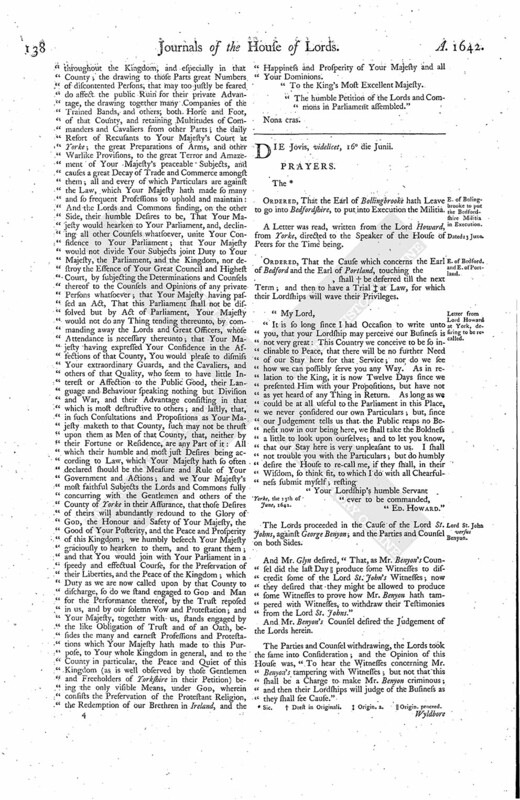 Lord Pagett, have Power to dispose of the Magazine of the said County, notwithstanding any Order formerly made to the contrary: And the Lords and Commons in Parliament do require all and every the said Persons, so nominated and approved to be the said Deputies, Personally to attend the said Service, at the Days and Times appointed, or to be appointed, for the same: And it is further Ordered, That such Persons as shall not obey the said Persons, nominated and approved to be the said Deputies, or any Two or more of them, in any of the Premises in the said Ordinance contained, shall answer their Neglect and Contempt to the Lords and Commons in a Parliamentary Way, and not otherwise, nor elsewhere." 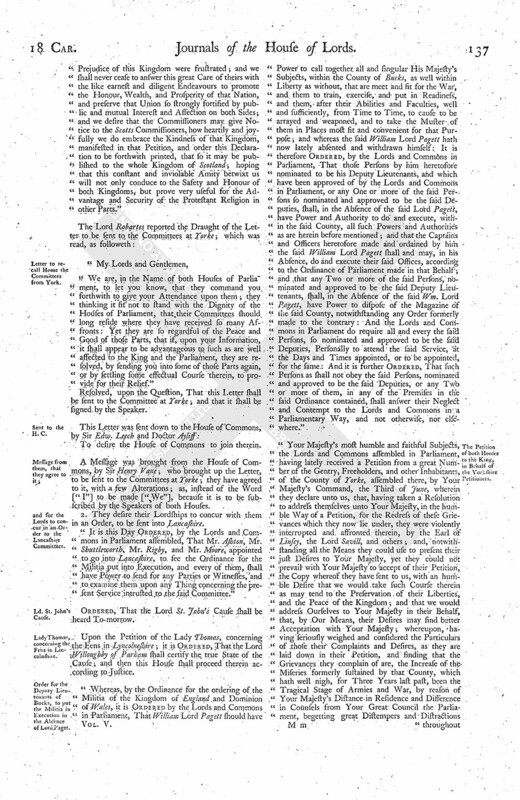 "Your Majesty's most humble and faithful Subjects, the Lords and Commons assembled in Parliament, having lately received a Petition from a great Number of the Gentry, Freeholders, and other Inhabitants, of the County of Yorke, assembled there, by Your Majesty's Command, the Third of June, wherein they declare unto us, that, having taken a Resolution to address themselves unto Your Majesty, in the humble Way of a Petition, for the Redress of these Grievances which they now lie under, they were violently interrupted and affronted therein, by the Earl of Linsey, the Lord Savill, and others; and, notwithstanding all the Means they could use to present their just Desires to Your Majesty, yet they could not prevail with Your Majesty to accept of their Petition, the Copy whereof they have sent to us, with an humble Desire that we would take such Course therein as may tend to the Preservation of their Liberties, and the Peace of the Kingdom; and that we would address Ourselves to Your Majesty in their Behalf, that, by Our Means, their Desires may find better Acceptation with Your Majesty; whereupon, having seriously weighed and considered the Particulars of those their Complaints and Desires, as they are laid down in their Petition, and finding that the Grievances they complain of are, the Increase of the Miseries formerly sustained by that County, which hath well nigh, for Three Years last past, been the Tragical Stage of Armies and War, by reason of Your Majesty's Distance in Residence and Difference in Counsels from Your Great Council the Parliament, begetting great Distempers and Distractions throughout the Kingdom, and especially in that County; the drawing to those Parts great Numbers of discontented Persons, that may too justly be feared do affect the public Ruin for their private Advantage, the drawing together many Companies of the Trained Bands, and others, both Horse and Foot, of that County, and retaining Multitudes of Commanders and Cavaliers from other Parts; the daily Resort of Recusants to Your Majesty's Court at Yorke; the great Preparations of Arms, and other Warlike Provisions, to the great Terror and Amazement of Your Majesty's peaceable Subjects, and causes a great Decay of Trade and Commerce amongst them; all and every of which Particulars are against the Law, which Your Majesty hath made so many and so frequent Professions to uphold and maintain: And the Lords and Commons finding, on the other Side, their humble Desires to be, That Your Majesty would hearken to Your Parliament, and, declining all other Counsels whatsoever, unite Your Considence to Your Parliament; that Your Majesty would not divide Your Subjects joint Duty to Your Majesty, the Parliament, and the Kingdom, nor destroy the Essence of Your Great Council and Highest Court, by subjecting the Determinations and Counsels thereof to the Counsels and Opinions of any private Persons whatsoever; that Your Majesty having passed an Act, That this Parliament shall not be dissolved but by Act of Parliament, Your Majesty would not do any Thing tending thereunto, by commanding away the Lords and Great Officers, whose Attendance is necessary thereunto; that Your Majesty having expressed Your Considence in the Affections of that County, You would please to dismiss Your extraordinary Guards, and the Cavaliers, and others of that Quality, who seem to have little Interest or Affection to the Public Good, their Language and Behaviour speaking nothing but Division and War, and their Advantage consisting in that which is most destructive to others; and lastly, that, in such Consultations and Propositions as Your Majesty maketh to that County, such may not be thrust upon them as Men of that County, that, neither by their Fortune or Residence, are any Part of it: All which their humble and most just Desires being according to Law, which Your Majesty hath so often declared should be the Measure and Rule of Your Government and Actions; and we Your Majesty's most faithful Subjects the Lords and Commons fully concurring with the Gentlemen and others of the County of Yorke in their Assurance, that those Desires of theirs will abundantly redound to the Glory of God, the Honour and Safety of Your Majesty, the Good of Your Posterity, and the Peace and Prosperity of this Kingdom; we humbly beseech Your Majesty graciously to hearken to them, and to grant them; and that You would join with Your Parliament in a speedy and effectual Course, for the Preservation of their Liberties, and the Peace of the Kingdom; which Duty as we are now called upon by that County to discharge, so do we stand engaged to God and Man for the Performance thereof, by the Trust reposed in us, and by our solemn Vow and Protestation; and Your Majesty, together with us, stands engaged by the like Obligation of Trust and of an Oath, besides the many and earnest Professions and Protestations which Your Majesty hath made to this Purpose, to Your whole Kingdom in general, and to the County in particular, the Peace and Quiet of this Kingdom (as is well observed by those Gentlemen and Freeholders of Yorkshire in their Petition) being the only visible Means, under God, wherein consists the Preservation of the Protestant Religion, the Redemption of our Brethren in Ireland, and the Happiness and Prosperity of Your Majesty and all Your Dominions. "The humble Petition of the Lords and Commons in Parliament assembled."